FAQs / How can you set a Payment Range on the EZRentOut Webstore? 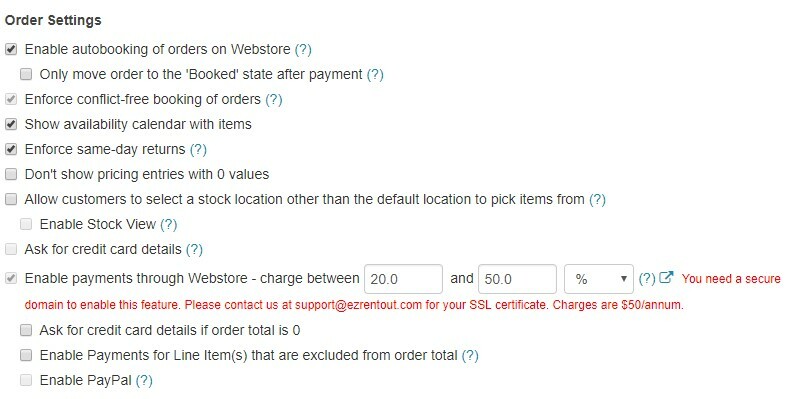 On the EZRentOut Webstore, users can charge a portion of the rental at the time of checkout. This mitigates the risk of customers abandoning rentals at the last moment. Ensuring that they pay a portion of the fee helps bind them to the transaction and ensures your rental business doesn’t suffer. Users can set a range of acceptable payment amounts, and allow customers to choose to pay whatever amount they would prefer from within that range. These upper and lower bounds can be set to monetary values or percentages of the total price of the rental. In order to configure this range, go to Settings → Store Settings → Order Settings. Here, check the option to ‘Enable payments through Webstore‘ and specify the maximum and minimum values that you would like to charge. As mentioned earlier, you can choose between a fixed monetary range or a percentage range of the applicable total. Here, we chose to charge a percentage payment range for all our online rentals. If you want it to be a fixed amount/percentage and not a range, you can set both the bounds to the same value. In the image above, we chose a lower bound of 20% and an upper bound of 50% of the total sum. Here is an example of this payment range in play on the Webstore. The total amount due is $567.30, and 20% of $567.30 comes out to be $113.46. This is what the customer would have to pay. By default, customers are suggested to pay the lower bound of the price but they can alter the amount field and pay whatever they like.